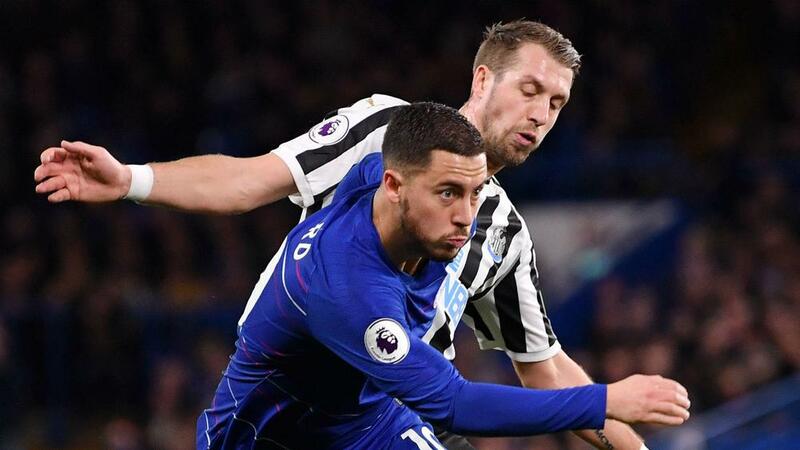 Playing Eden Hazard as a striker provides Chelsea with greater balance defensively, according to Maurizio Sarri. Belgium international Hazard has frequently played through the middle this season with Alvaro Morata and Olivier Giroud struggling for form. The 28-year-old was deployed in the centre of the attack for the 2-1 victory over Newcastle United on Saturday and he set up Willian for the winning goal after Ciaran Clark cancelled out Pedro's opener. Asked if Hazard enjoyed operating as a striker, Sarri said: "Not in the first half. In the second half my feeling was that he enjoyed it. "I wanted to see the solution with three small players. I think in this moment it is a very good solution because we are not less dangerous in the offensive phase and then in the defensive phase we are more balanced. "In the last six matches, we conceded only three goals and one was from a penalty. I think that at the moment, in the defensive phase, we are doing very well. One of the reasons I think, in my opinion, is that Eden is playing in that position." Sarri acknowledged that having Hazard leading the line makes it difficult for Chelsea to penetrate the box, an area he pointed to as requiring improvement. "For his characteristics, of course, he goes in the direction of the ball. We need to learn to attack spaces, or attack the box with the other players," he said. "It was better [against Newcastle] with the other wingers in attacking spaces. We scored after 10 minutes by attacking spaces behind the lines with Pedro. I remember very well at the beginning of the second half, we had the same situation with Willian. "So it is better now. We need to improve in attacking the box. When the ball is outside, it is impossible for Eden to stay in the box."